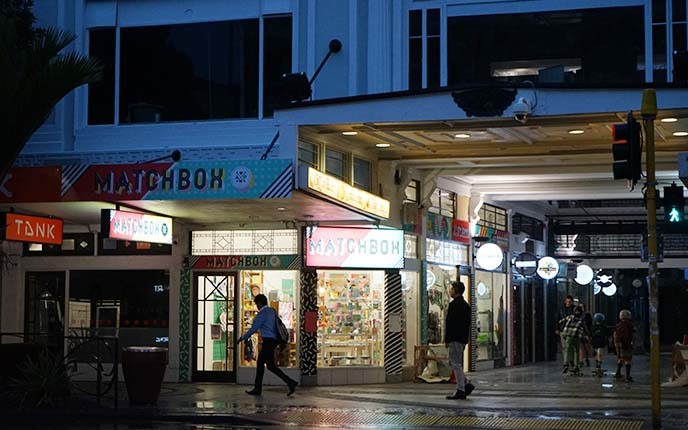 Auckland’s alternative shops & clubs! 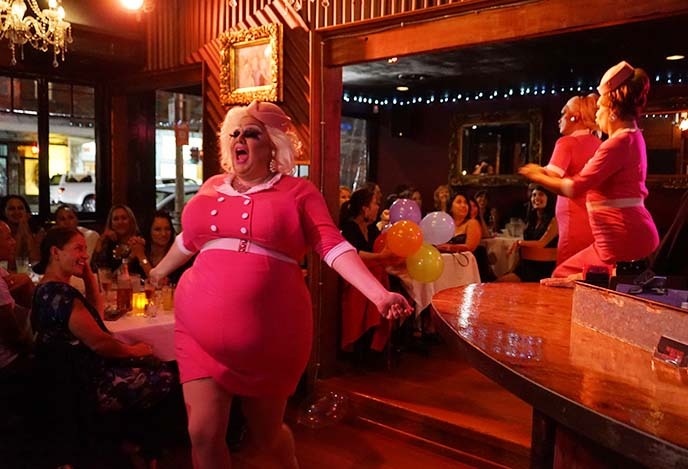 K Road New Zealand drag queen show, Caluzzi Cabaret. Now that I’ve been to New Zealand, I understand why travel bloggers consistently put the country on their “top destinations” lists. The photo above sums it up: dramatic nature and oceans, Lord of the Rings vibes. 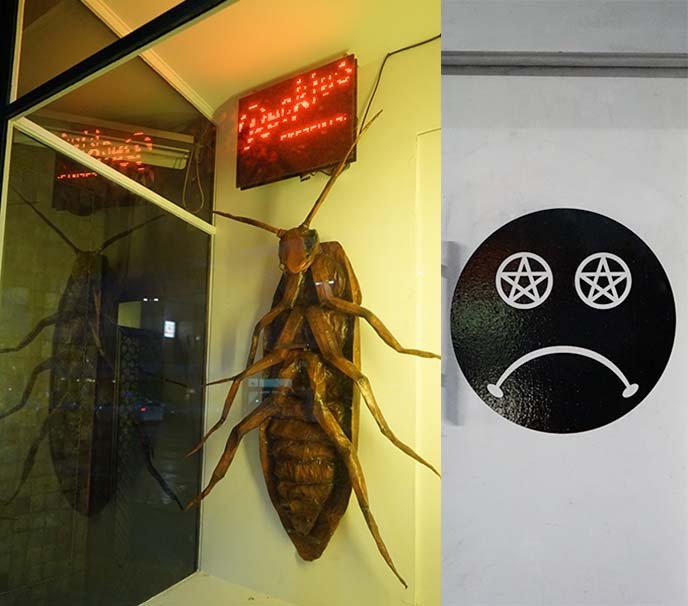 And Auckland has a fabulous underground culture as well, which I’ll show you in this final post. As you’ll recall, I joined the Contiki Sun and Steam tour (with a fun group of fellow young travellers). The trip began and ended in Auckland, NZ’s largest urban area. 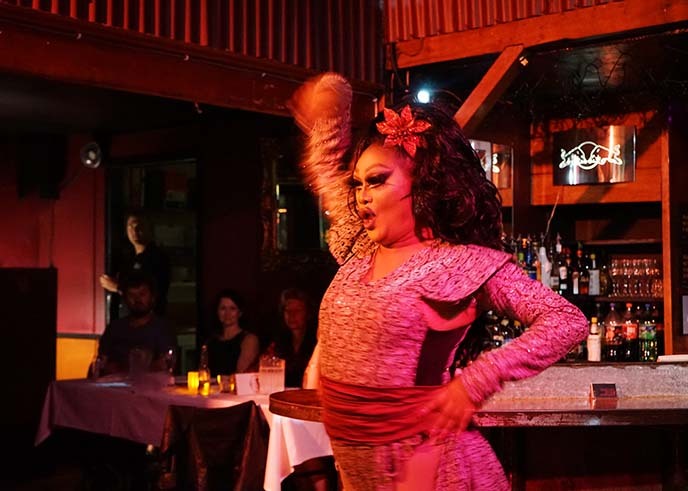 I’ll take you inside the fierce and funny world of Caluzzi Cabaret — a drag queen extravaganza located on the infamous nightlife strip, K Road. 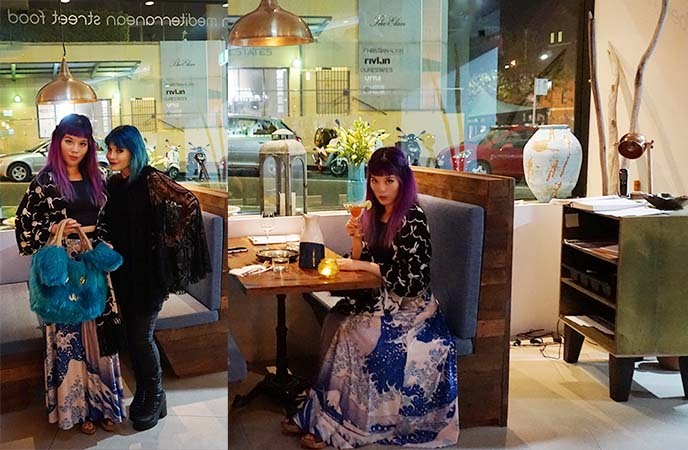 Outfit details: I’m wearing a pentagram occult dress and cape by Black Milk Clothing. They also have a Game of Thrones map print dress that I love, and it’s in the same style as the one I’m wearing. 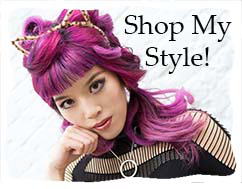 I’m never going to part with this fluffy monster bag… but I do have other kawaii and Goth Japanese fashion available, on my fashion blogger shop (come browse). Contiki group tours are catered to 18-35 year old travellers, meaning that we had a lot of free time to enjoy nightlife, and explore Auckland on our own. 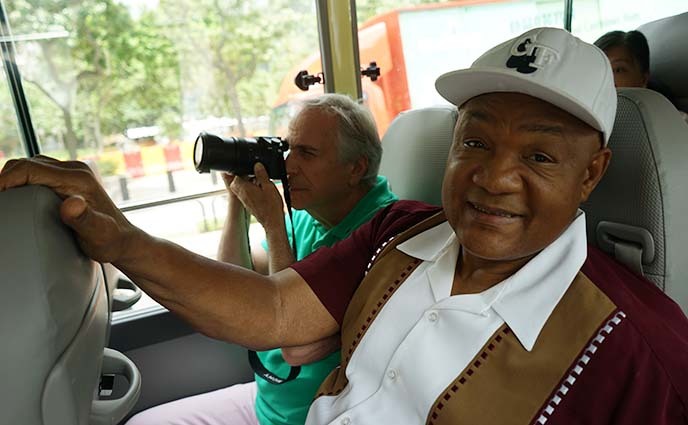 At the same time, our tour leader Monique and driver Dyson made sure we had a superb overview of the city’s top attractions. They were always glad to give us recommendations, and join in on the fun. 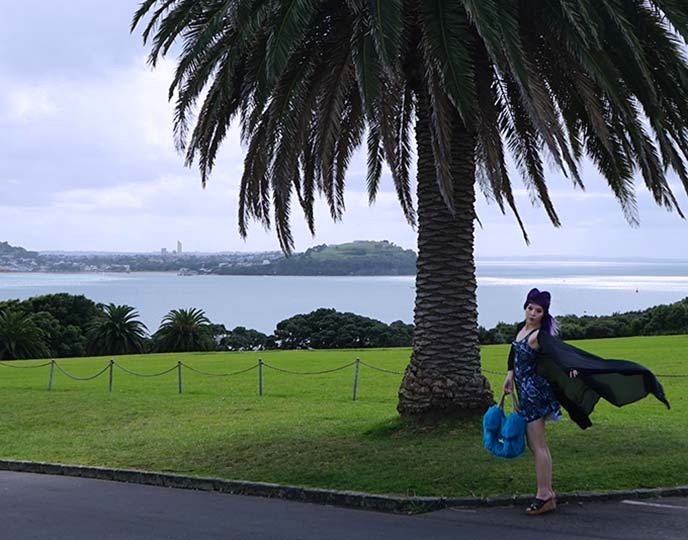 We stopped at Bastion Point to take in the gorgeous views of Waitemata Harbour and the city of Auckland. 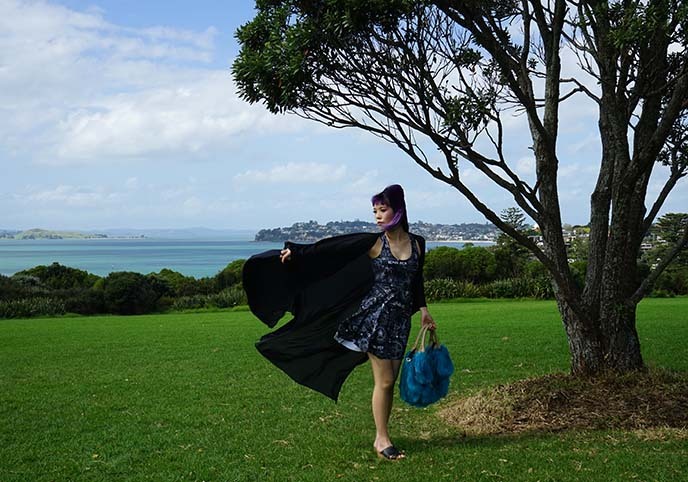 The wind added drama to my Black Milk cape! I found this epic view of the Sky Tower, which rises like a spaceship in the distance. We walked around the Michael Joseph Savage Memorial Park. It’s a tribute to the first Labour Prime Minister of New Zealand, known for his progressive welfare policies. Savage is revered as one of NZ’s greatest prime ministers. 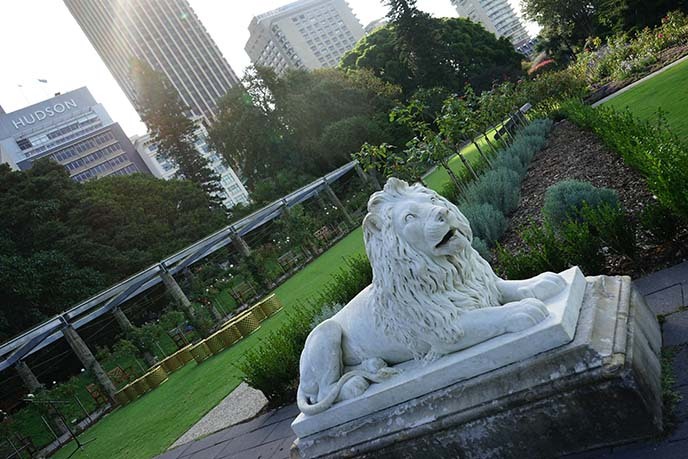 His tomb lies by a reflecting pond and these beautiful gardens. … And these ladies really know how to put on a show! 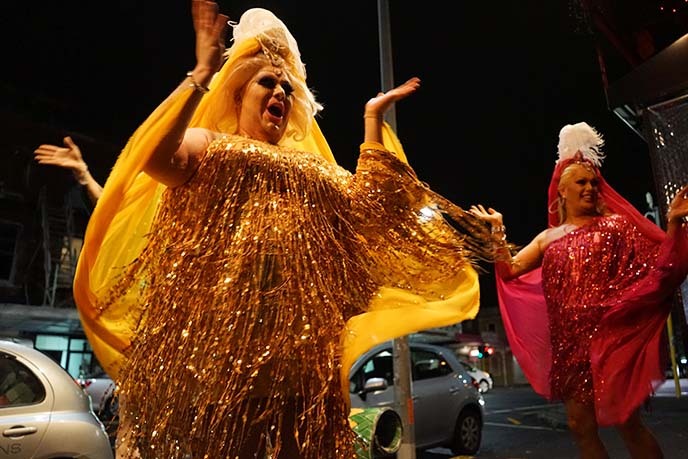 I was thrilled to see the famous drag queens of Caluzzi Bar and Cabaret, located on the famous K Road (the gritty, alternative nightlife strip of Auckland.) Address: 461 Karangahape Rd, Eden Terrace, Auckland 1010. 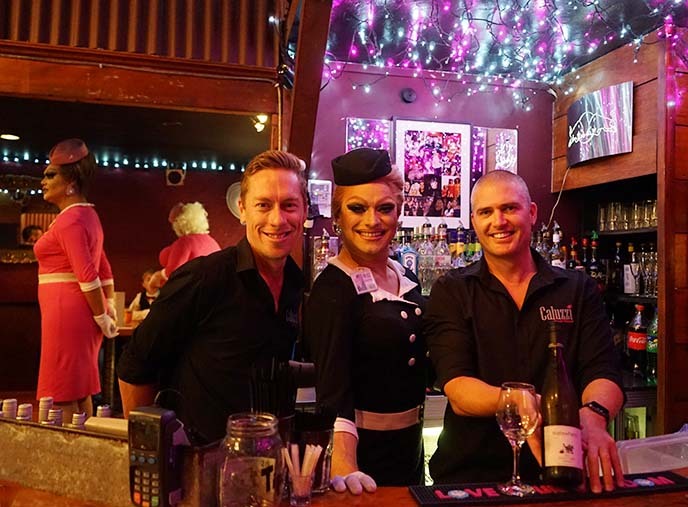 I was welcomed by the friendliest bartenders and queens, who made sure I always had full glass of local Matawhero wine. 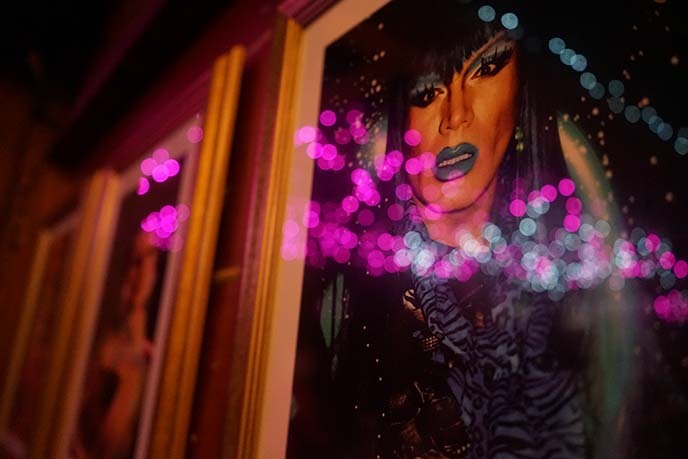 Caluzzi is a drag queen cabaret with a wonderfully inclusive atmosphere. The tables were packed with groups of friends, bachelorette / hen parties, and lots of locals. The gals put on a fierce floor show, with a funny air stewardess theme. They dazzled us with their choreographed dancing and singing, working the floor in their glittering stilettos. Established in 1996, Caluzzi has become known as one of the best nightlife venues in the city. 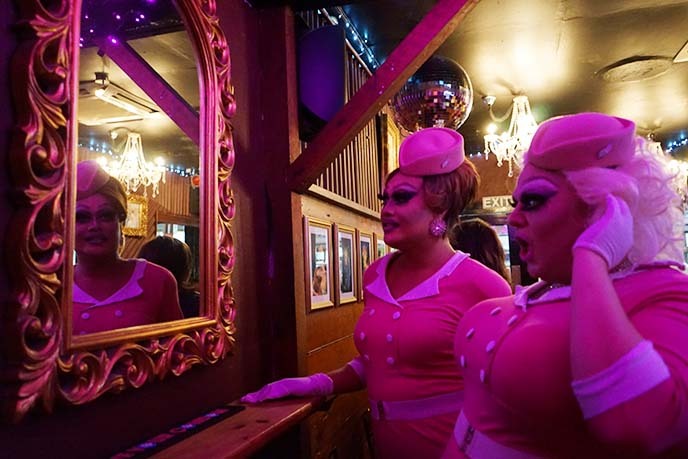 The drag performers are top-notch: makeup, wigs and outfits are all on point. These ladies went around the room, chit-chatting and posing with the guests. Such a welcoming atmosphere, and I couldn’t stop smiling at their wicked, campy remarks. 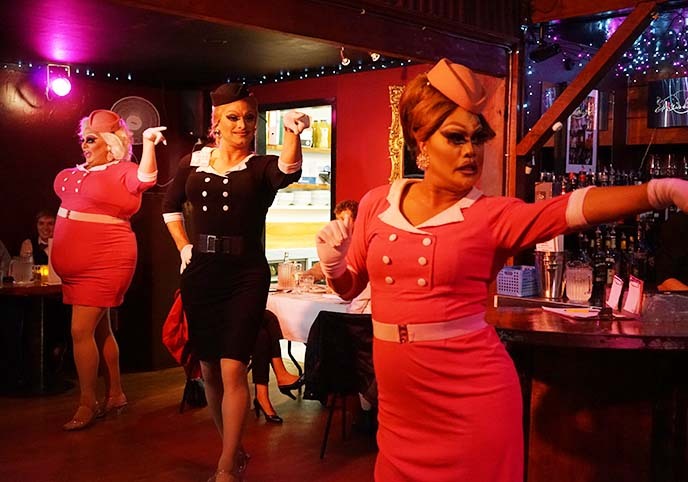 Between the song-and-dance hilarity, the drag queens played the part of the perfect stewardesses, and took our meal orders. We got to choose from a variety of tasty main courses, and everyone got garlic bread and soup to start. While we dined, the ladies put on decadent costumes, and entertained us with a variety of routines. In this group number, they went outside and performed in the street, while we watched from the window! Other acts involved audience participation, dance-offs, and even a Maori-inspired performance. 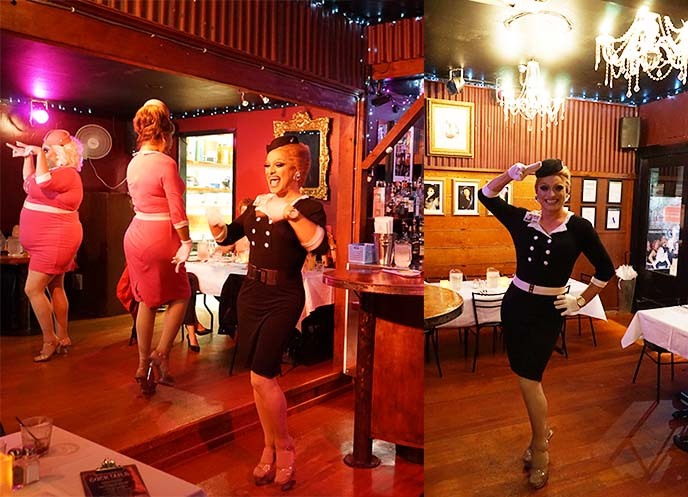 Caluzzi Cabaret in Auckland is pure fabulosity. Be sure to reserve a space in advance, as the seats fill up fast. Check out their website for upcoming showtimes and bookings, and say “hiiii” to the gals for me. 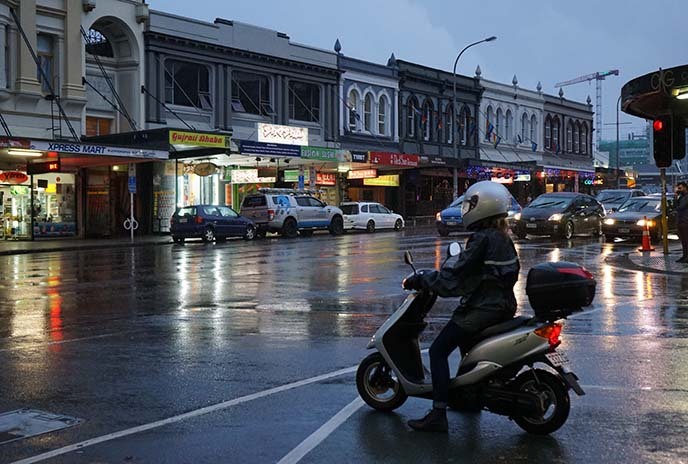 K Road, the nickname for Karangahape Road, is known for its colorful and grungy nightlife. 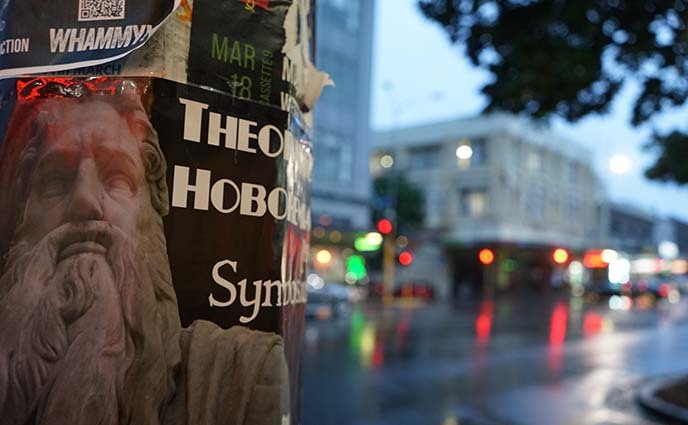 You’ll find dive bars, strip clubs and tattoo shops here (but don’t worry, Auckland is not at all dangerous). There are also lots of cute, hipster boutiques. 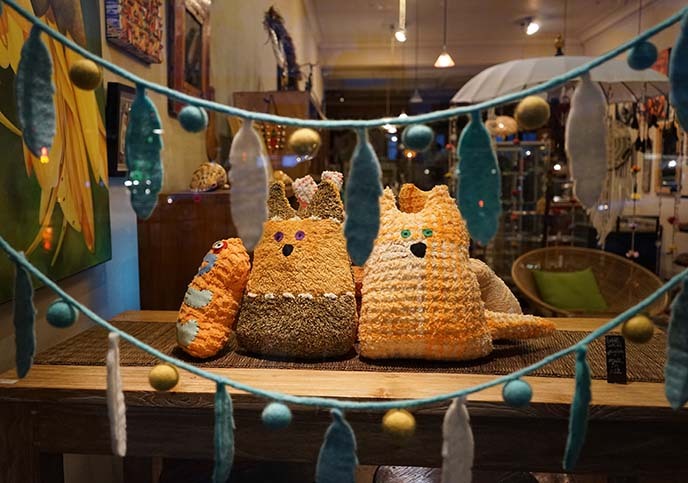 These fox pillows caught my eye. 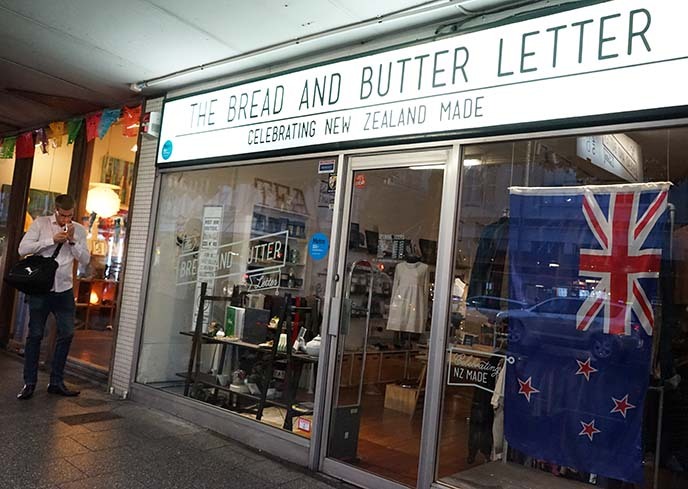 K Road is one of the best places to shop for NZ made fashion, and independent designers. 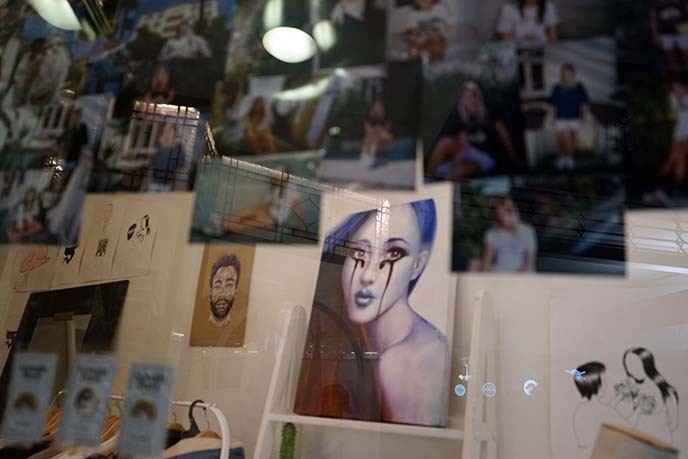 Come during the day-time, so that you can shop the alternative design stores. You’ll never be bored on K Road. 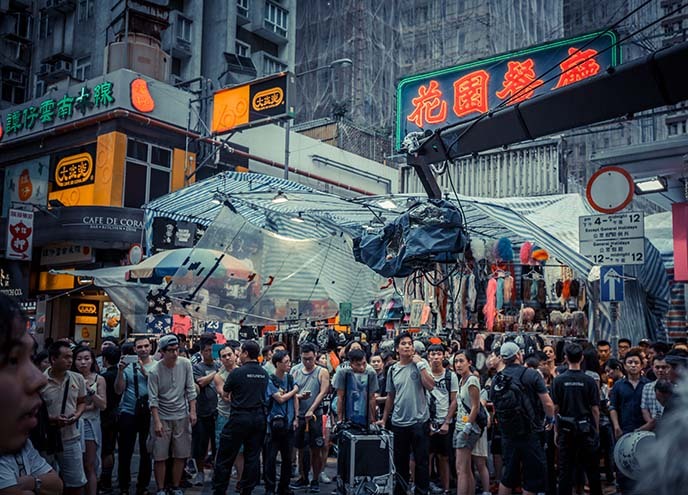 At night, it comes alive with bars, performances, ethnic restaurants, you nae it. I ran into a group of teenage skater boys. 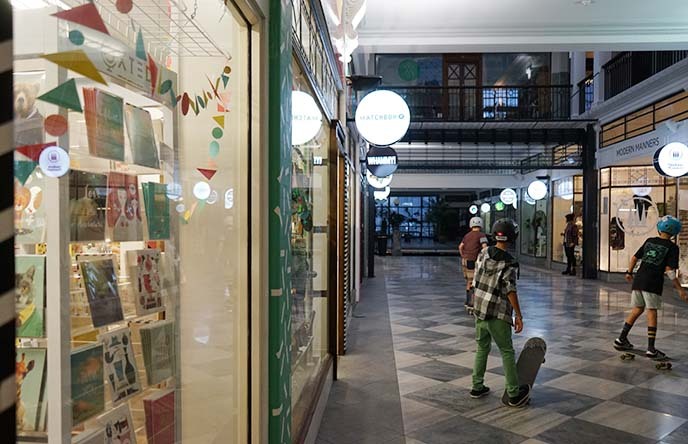 When the stores are closed, they use the smooth floors for practising tricks. Kia Ora to Contiki for the once-in-a-lifetime journey! 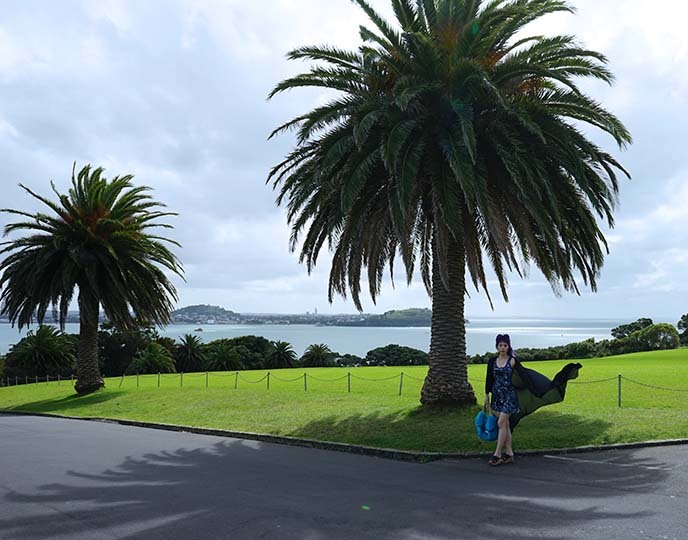 I also wrote about the experience on Business Insider Travel, and you can see all my New Zealand posts here, in this blog category. And now, it’s time to fly away to my next destination. I still have lots of Slovenia and Scandinavia posts to share with you, and I’ll be somewhere both old and new in the upcoming weeks. 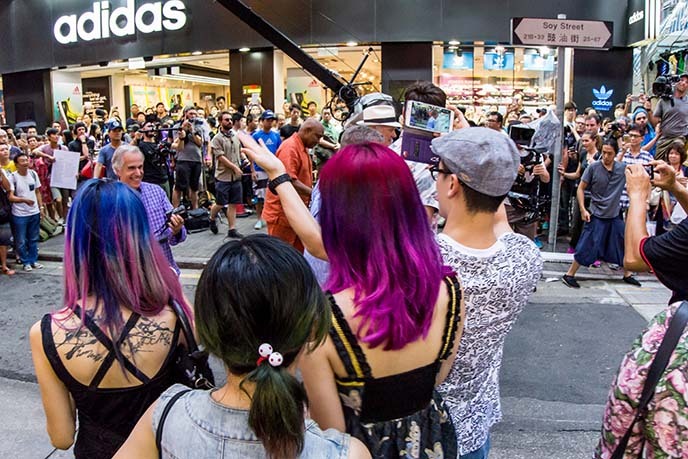 Better Late Than Never, Hong Kong: travel TV show with William Shatner, Henry Winkler! Sydney Opera House. 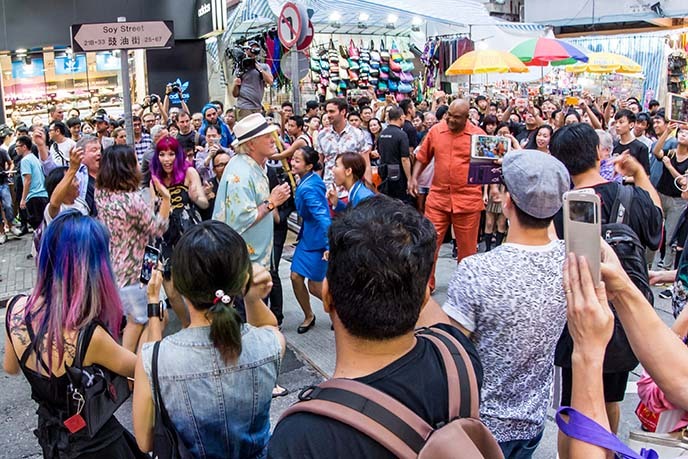 Thank you for your fantastic response to the Hong Kong episode of Better Late Than Never, the new NBC show travel TV show! 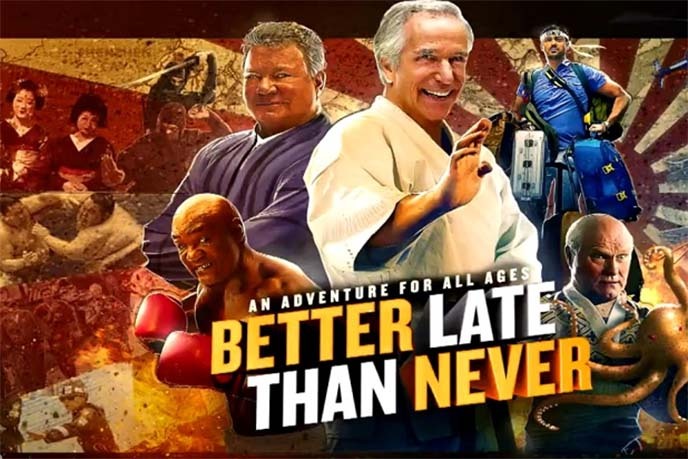 I’m very happy that “Better Late Than Never” has been raising lots of laughs and positive reactions! I couldn’t believe it when the producers contacted me to be part of the series. 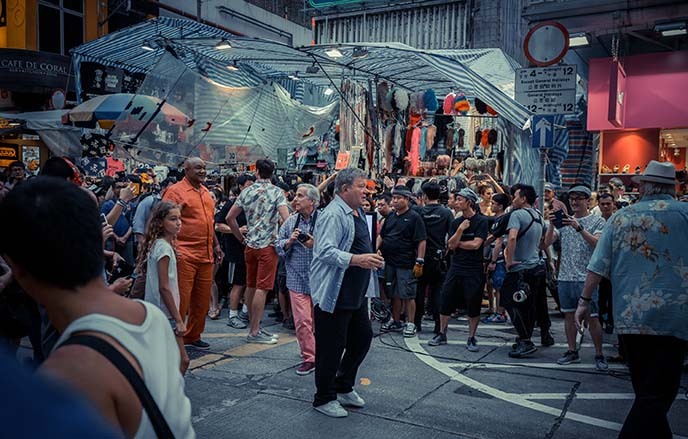 I was flown to Hong Kong and got to take part in this second episode. 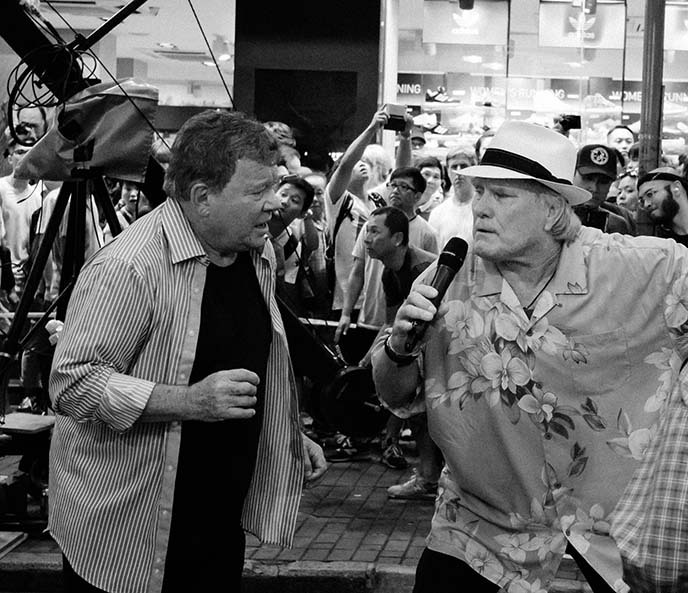 This hilarious travel-reality show stars Terry Bradshaw (quarterback and broadcaster), William Shatner (Star Trek’s Capt. 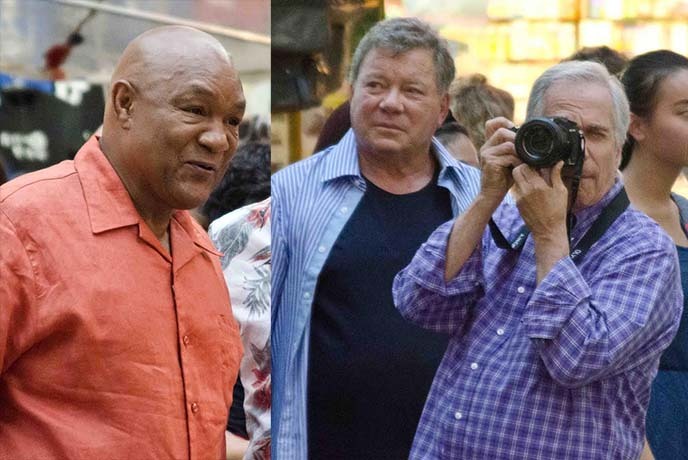 Kirk), Henry Winkler (The Fonz on Happy Days) and George Foreman (boxer and grill-master). 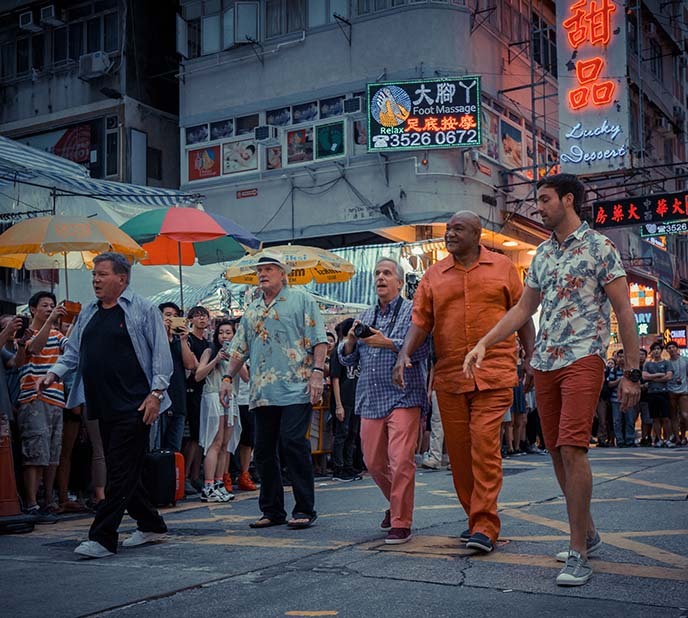 Along with comedian Jeff Dye, these funny guys travel around Asia in search of adventures and Zen, with lots of mishaps along the way. 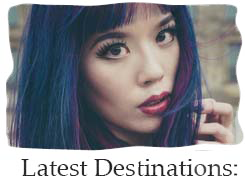 Their journey throughout Asia includes Tokyo, Kyoto, Seoul, Bangkok and Chiang Mai. 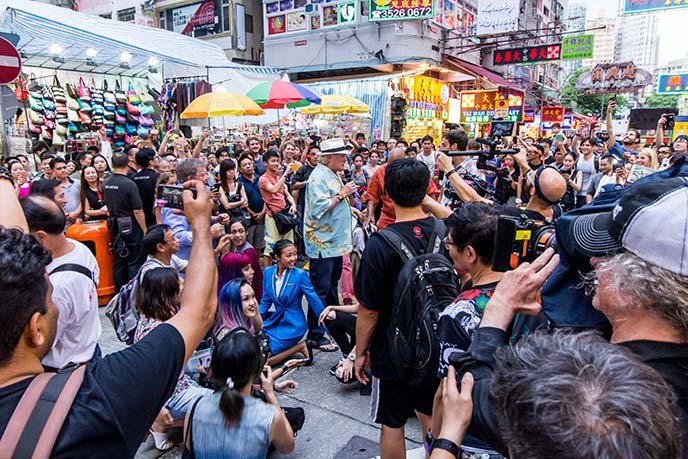 I was thrilled to have them be in Hong Kong with me — my friends and family even got to join the big dance scene in Mongkok. The weather was a little iffy that day, but the rain and clouds cleared in time for the big dance number. 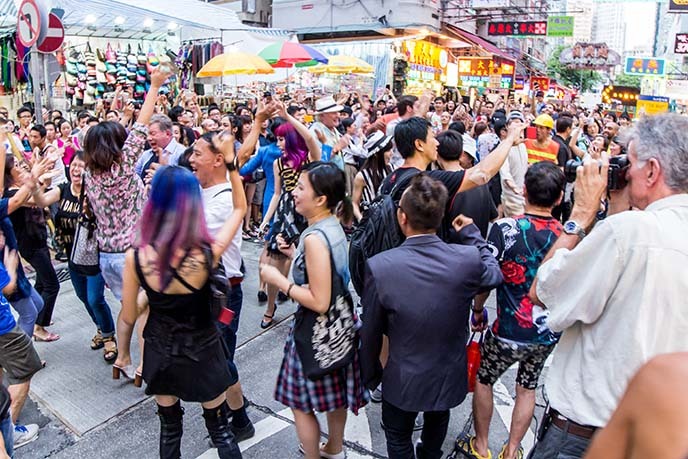 Believe it or not, we took over one of the busiest streets of Hong Kong! 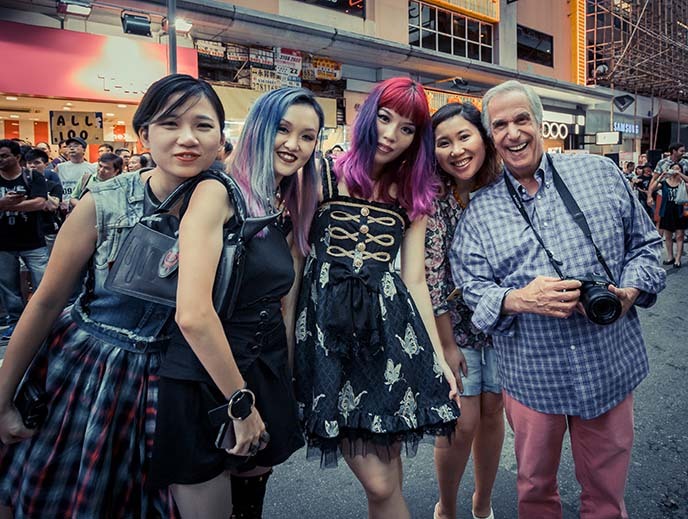 The Fab Four arrived on the scene — Henry Winkler turned his camera on us for this shot. Terry Bradshaw whipped out a microphone and burst into song! Then it was time to dance, dance, dance. I was impressed by their ability to pull off a choreographed number! 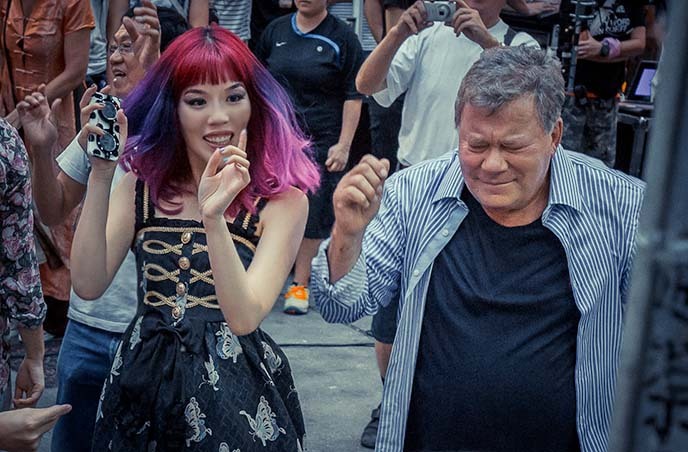 So much fun, to dance in the streets with Captain Kirk and Fonzie! I was glad to have my local friends with me, to take part in the scene. 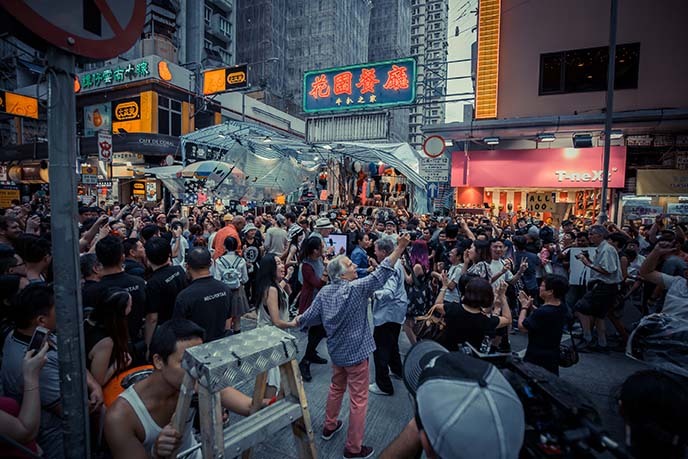 Chaos, color, song… that’s the spirit of Hong Kong! 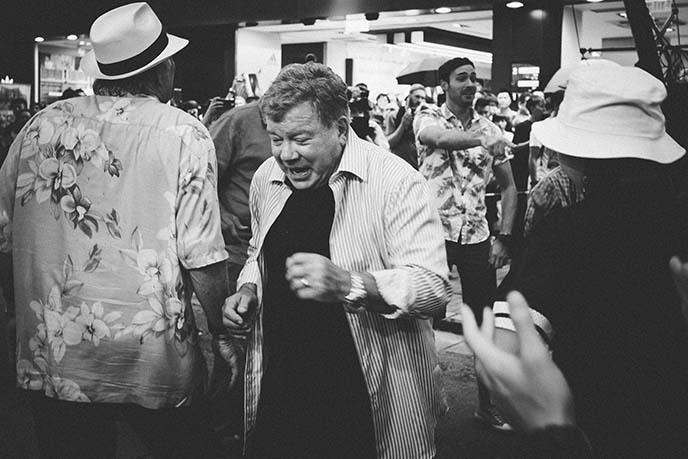 Can you see me dancing with William Shatner in the middle? What a joy to joke and riff with Henry Winkler and George Foreman, for this TV scene. They’re truly kind and humble, and up for anything! Here are more black and white images from Thomas Sandfield of Sandfield Productions. 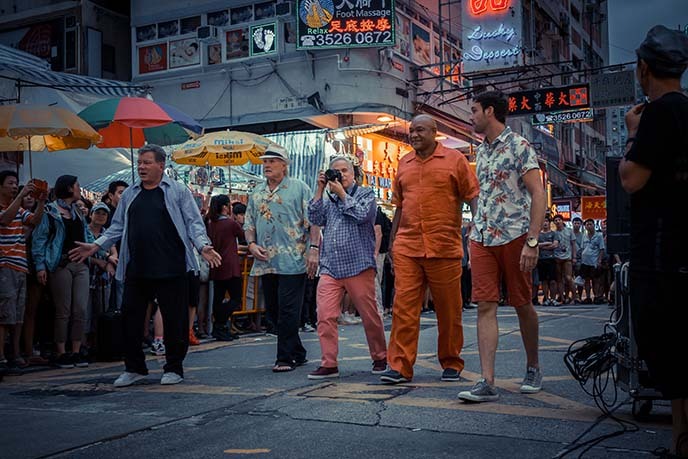 It was a genius idea to pair “culture and Zen” William Shatner with “let’s roughhouse and sing” Terry Bradshaw on a travel show! Above shots by Arthur Rash. 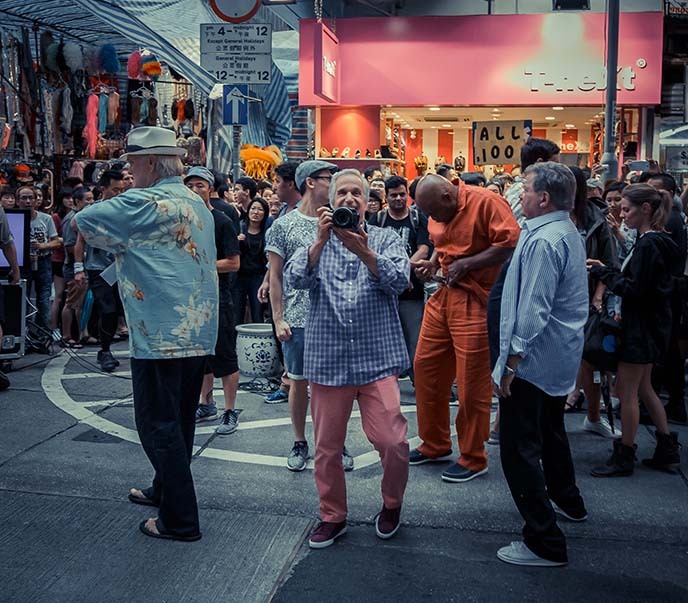 Thanks to everyone who supported the TV shoot, and for watching NBC’s Better Late Than Never! 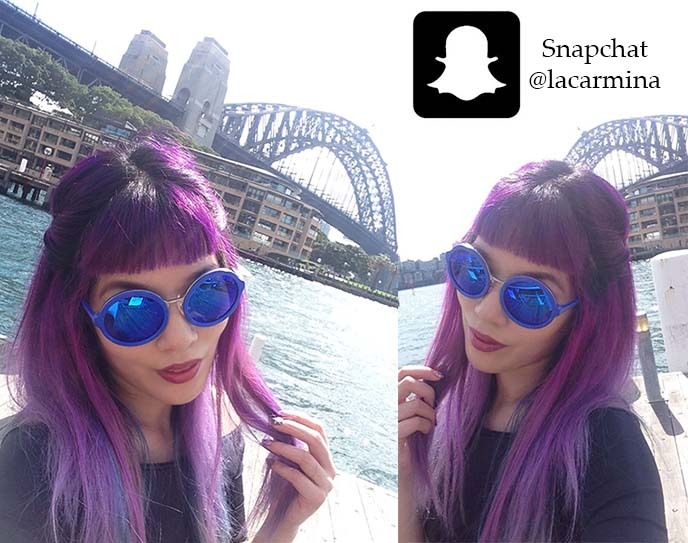 On that note… I never got around to posting about my travels in Sydney, Australia. But better late than never, right? 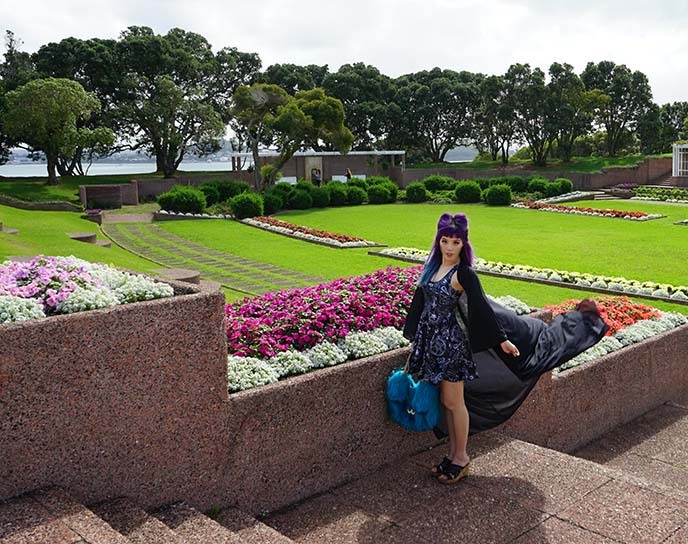 I’m wearing a Black Milk top and skirt: this Great Wave maxi-skirt is one of my favorites (see me wearing it at New Zealand’s Hobbit Town). 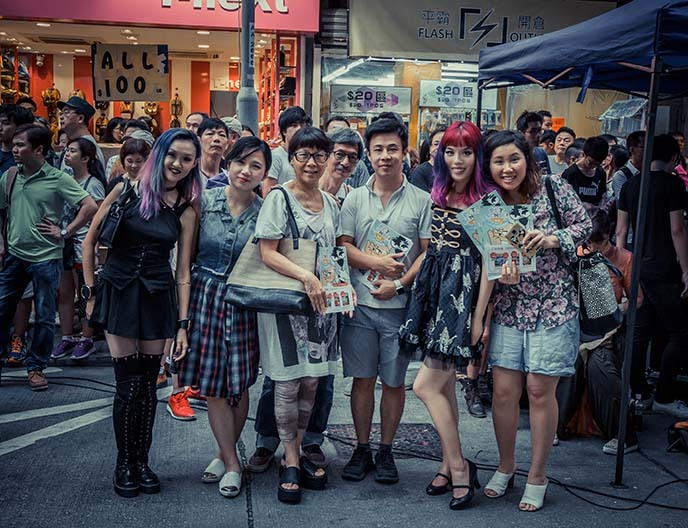 Blackmilk’s designs are fantastic for travel because they’re lightweight and don’t crease, and easy to pack in luggage. (And stylish, of course). My fuzzy purse is from Mercibeaucoup in Shinjuku. I had never been to Australia, and had very little time to explore. However, it was worth the trip to go down under and at least see Sydney. I’ll have to come back soon to see the Gold Coast, Melbourne and more. As a first-timer, I had to visit the Sydney Opera House. 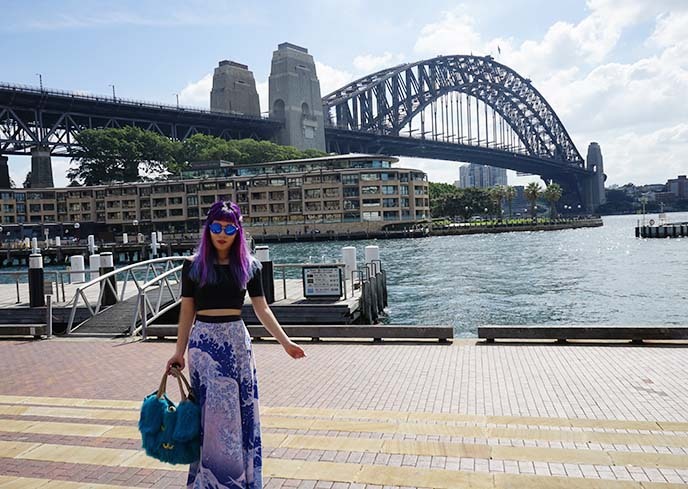 I took the subway to Circular Quay, and walked over. 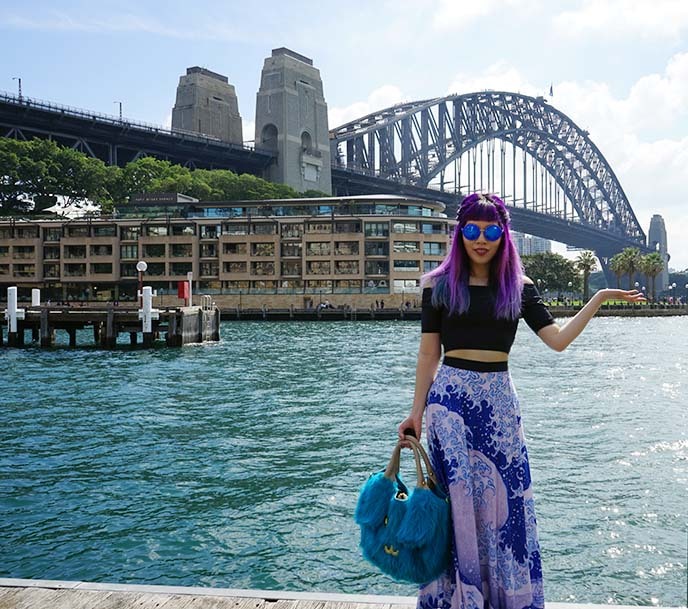 The Sydney Harbour Bridge is also located here. Many travellers do the “bridge climb” where they walk on top of the structure for panoramic views. 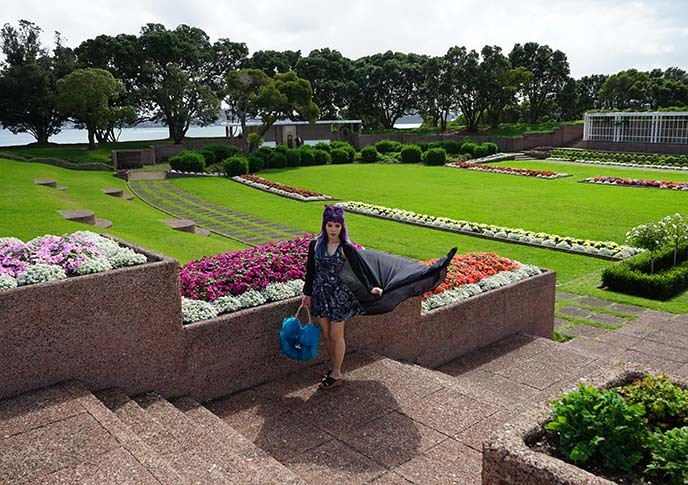 I’m not afraid of heights, but you aren’t allowed to take your own photos, and must wear a not-so-stylish jumpsuit… I’d prefer to pose below, wearing Black Milk! Even from “down under” the bridge, you can’t beat these views of the harbor. 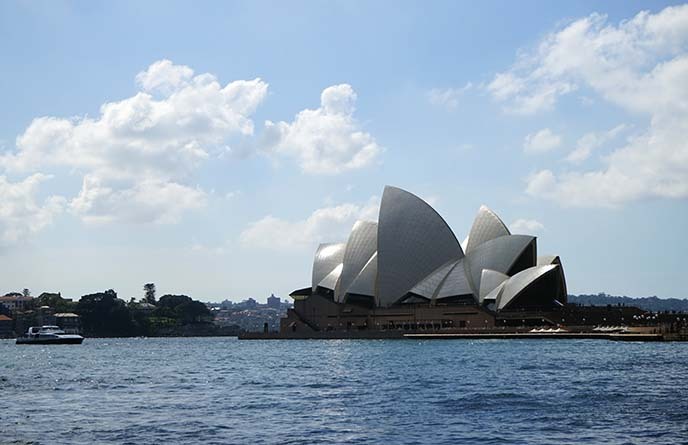 I don’t usually like to do “tourist” activities in cities, but I thoroughly enjoyed the Sydney Opera House tour. 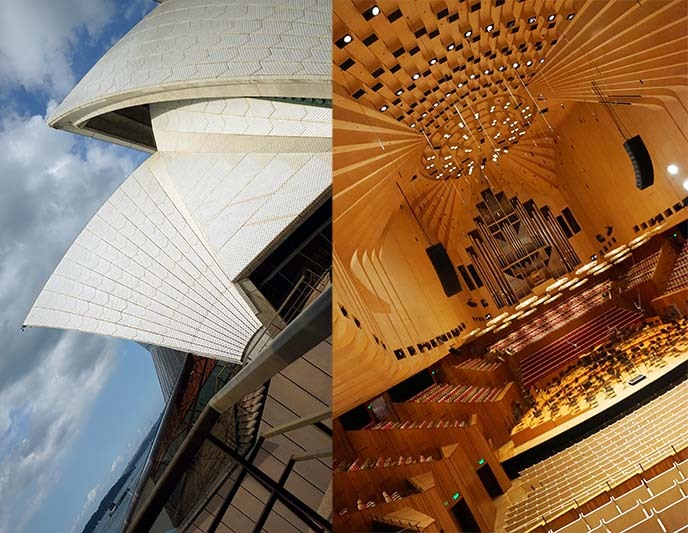 This guided tour lets you go inside the concert halls and see Jorn Utzon’s masterful architecture up close. 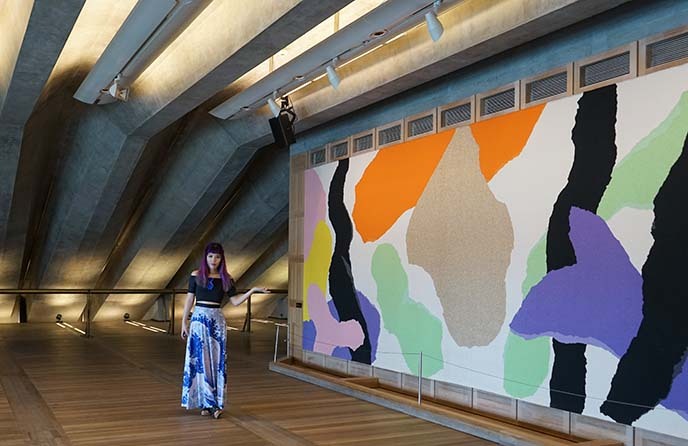 I had the opportunity to see Jørn Utzon’s room, defined by concrete structural beams and a 14 meter long tapestry of his own design. On the opposite end, giant windows overlook the harbour waters. Our guide spoke about how Utzon solved design problems in innovative ways, such as by peeling an orange to see how the curved sails could fit together. As you can tell, I learned so much from the multimedia Opera House tour. Anyone who is interested in modern architecture should check it out. I selected the Tour and Tasting Plate, which ends with an al fresco meal underneath the sails. 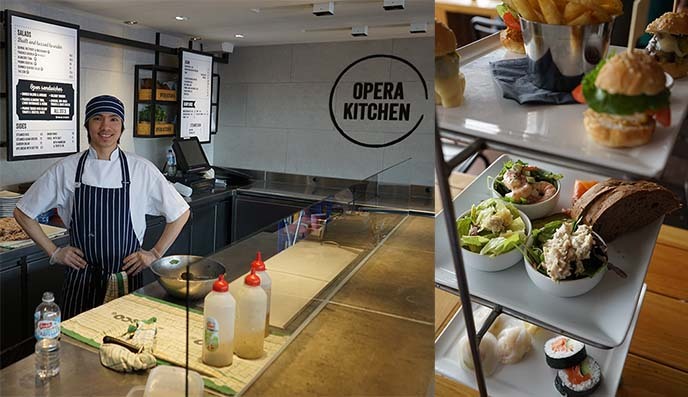 At Opera Kitchen, I got to try a three-tiered lunch set with a range of finger foods: sushi, mini burgers, dumplings, salad and more. 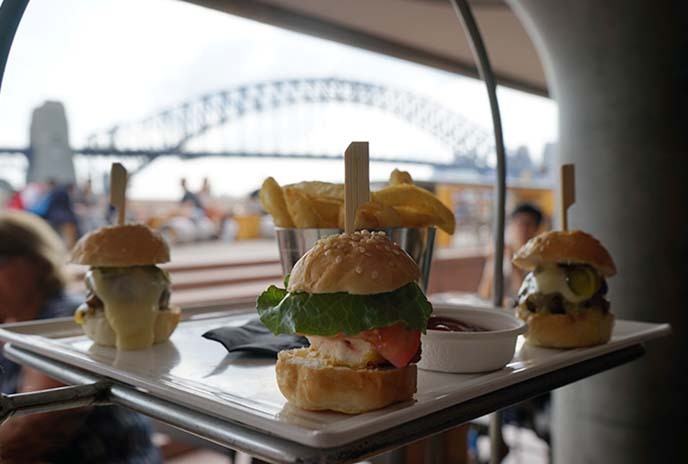 The perfect lunch for sharing with a friend, especially when paired with Australian pinot noir. 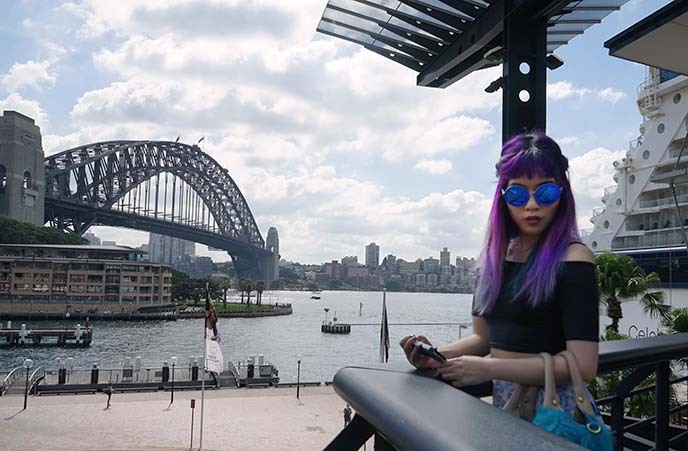 I got to enjoy the sunshine, and bask in this uninterrupted view of the Harbour Bridge and waters. 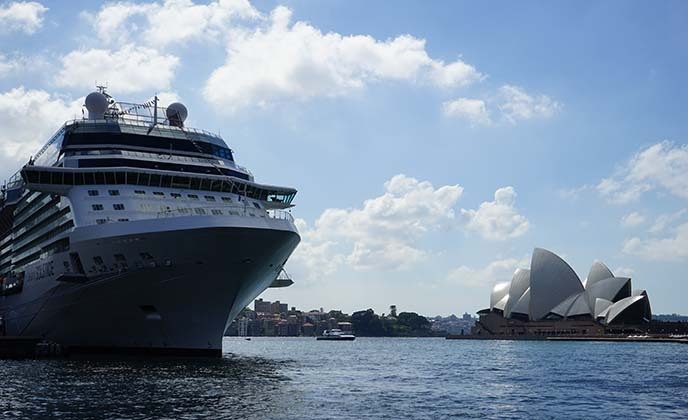 From Circular Quay, it’s a short walk to the Royal Botanic Garden. This large park is filled with different themed gardens, and has a pond and Asian pavilion. 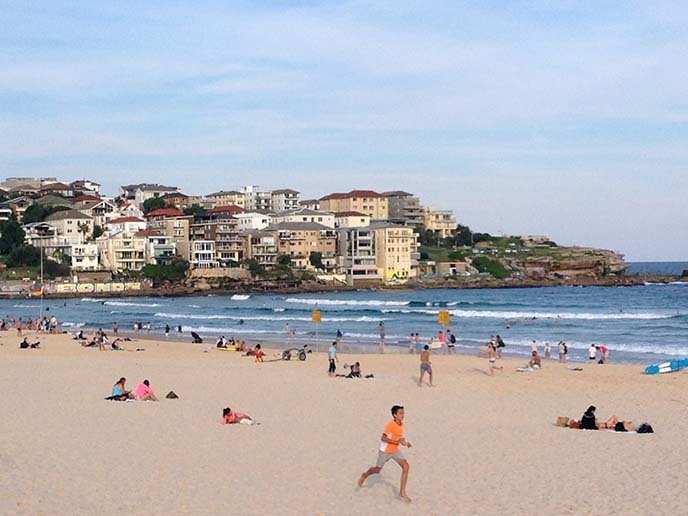 It would be tragic if went to Sydney and skipped out on Bondi beach. I rode the subway to Bondi Junction, and then hopped on the bus that runs frequently to the beach. When you see this curving cove of sand, you’ve arrived. This 1 km long beach is classic Sydney. 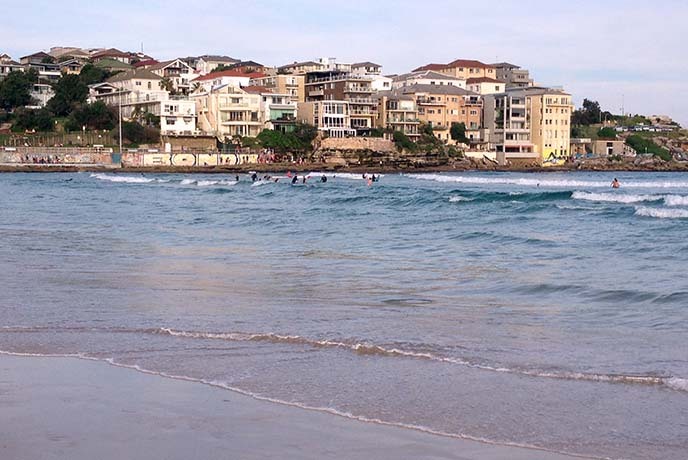 I watched surfers ride the waves, and walked barefoot on Bondi’s warm and soft sand. Time to chow down. I’ve heard that Sydney is famous for its breakfasts, and found this to be true. 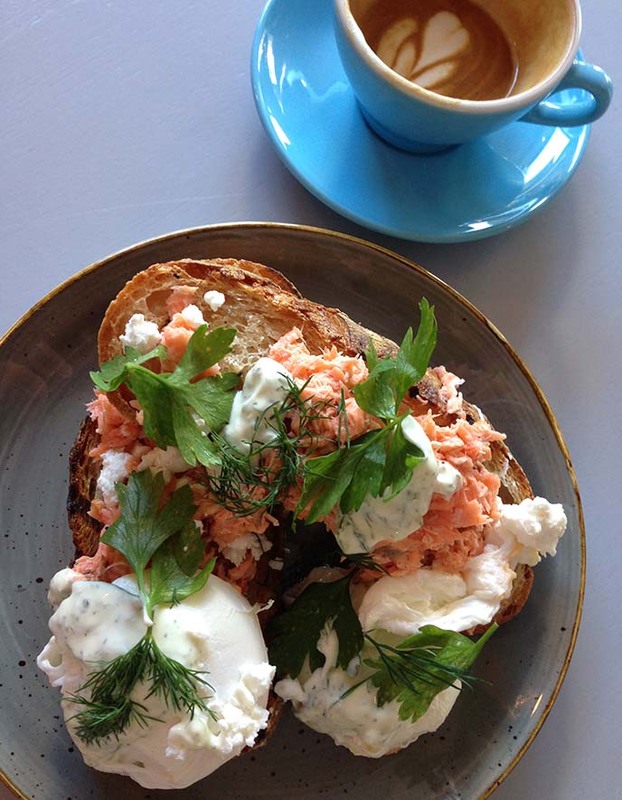 This salmon eggs Benedict, with an almond milk flat white, was as good as it looked on my Instagram. I was accompanied by my friend Leanne, writer at Trashtastika. We were charmed by the Middle Eastern ceramics near the windows. 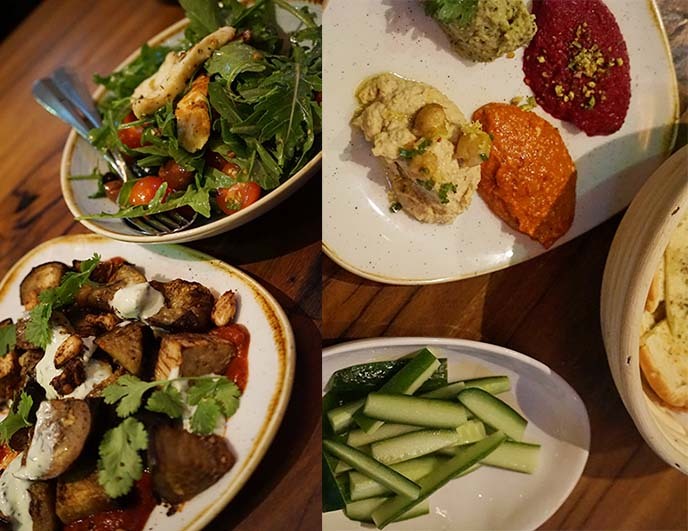 British chef Tom Kime launched Ceru as a celebration of Levantine cuisine. He incorporates flavors and recipes from the Eastern Mediterranean, infusing them with a modern interpretation. 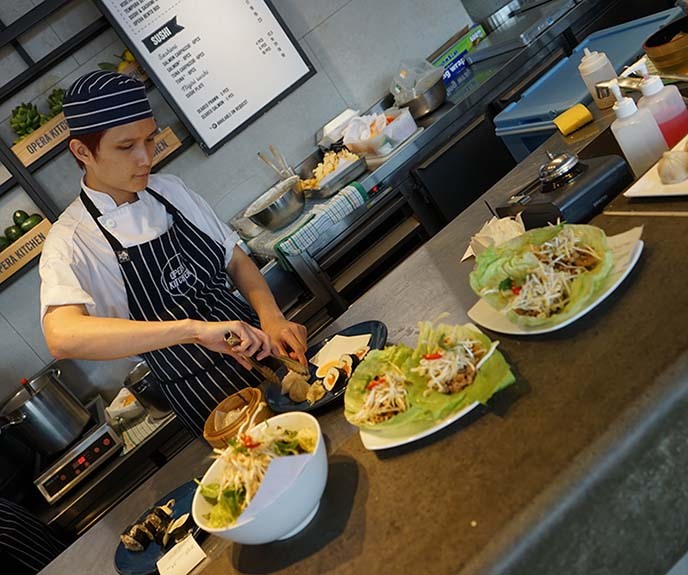 We started by sharing a spread of mezzes and salads. Beetroot and chickpea purees, with cucumber sticks and pita — everything is organic, and the menu is vegan and gluten free friendly. 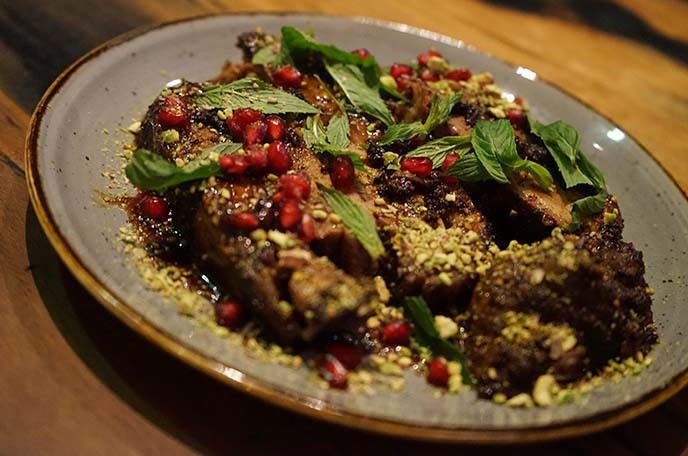 Fresh pomegranate, mint, and pistachio add dimension to this lamb dish. 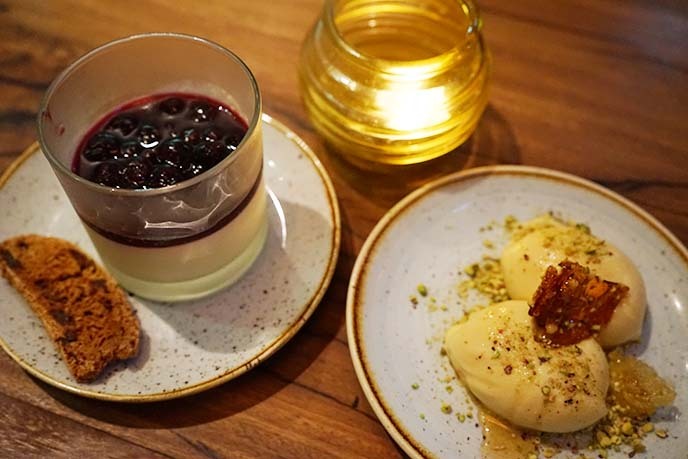 These Levant spices pair marvellously with Ceru’s craft cocktails and cold-pressed juices. I’m still thinking about Ceru’s honeycomb baklava ice cream… with flavors of burnt caramel and roasted nut. Possibly the tastiest and most creative dessert I’ve had all year. PS – you can find out more about Better Late Than Never on their website, including viewing times and clips. I leave you with a few more scenes from this huge network shoot. There were so many moving parts, but the team pulled it off. 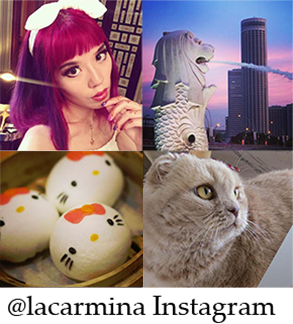 For more Hong Kong adventures and travel tips, check out all my posts here. And don’t forget to take a glimpse at my wardrobe sale.